The in-patient Palliative Care Unit provides expert end-of-life care to people experiencing life-threatening illness, within an environment that promotes clinical excellence, education, and research. Our Palliative Care Program focuses on patient and family-driven decision-making to maintain comfort, quality of life, spirituality, autonomy, and dignity of each dying person while supporting families through this difficult period and in bereavement. Palliative care services are directed to patients and their families/circle of supporters and respects that everyone approaches death from their own unique perspective based upon their individual values, spiritual beliefs, cultural roots, family dynamics and life experiences. Palliative care is active care which focuses on maintaining the quality of life, comfort, autonomy and dignity of each patient through the prevention, assessment and management of potentially distressing symptoms. Palliative care can be provided in all phases of illness, from early in the course of illness to bereavement. It is recommended that patients begin receiving palliative care support as early as possible, even at the time of diagnosis. The focus of care may change with the addition or continuation of some treatments and may mean stopping other forms of treatment. At HHS we have a number of palliative care resources to support our patients, families, staff and physicians with. May be experiencing complexities associated with their end-stage disease including delirium, aggression, agitation, etc. Require involvement of a palliative trained physician 1 to 2 times per week / daily skilled nursing interventions / active interprofessional goals involving some other professionals, such as: SW / OT / PT / Chaplain / Pharmacy / Dietitian / SLP / Therapeutic Recreation, etc. 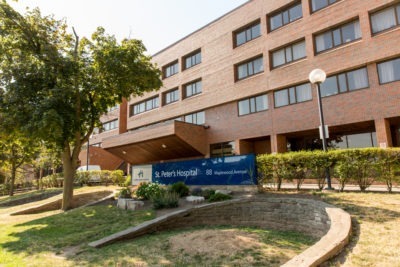 Urgent admissions from home to the St. Peter’s Palliative Care Program can usually be arranged within 48 hours following a referral. To receive comprehensive assessment and ongoing management of distressing symptoms: pain, nausea/vomiting, shortness of breath, restlessness, confusion, etc. To receive short-term intervention to bring symptoms under control and allow discharge home. To receive 24 hour supportive care during the actively dying phase of illness. To receive temporary placement to provide caregiver relief/respite.